Hot Water Cornbread just like Grandma use to make is more about the feel of the batter than precise measurements. Enjoy with collard greens, purple hull peas, and the list goes on! Making Old Fashioned Hot Water Cornbread is more about the feel of the batter than a precise measurement. The main thing is to get the right consistency with the water and cornmeal mixture. Mother was a walking cookbook, and this was one of those recipes she had in her head. So many of her recipes I wished I had asked her to write down. One day after we had finished a meal of Fried Okra, Peas, and Hot Water Cornbread, I did ask her to tell me how she made this Southern golden goodness. She said "you use plain cornmeal, and a little salt--no baking powder". Boil some water and add it to the cornmeal mixed with a little salt until it comes together enough to spoon it in a skillet of hot grease. I like a mixture of bacon grease and oil. 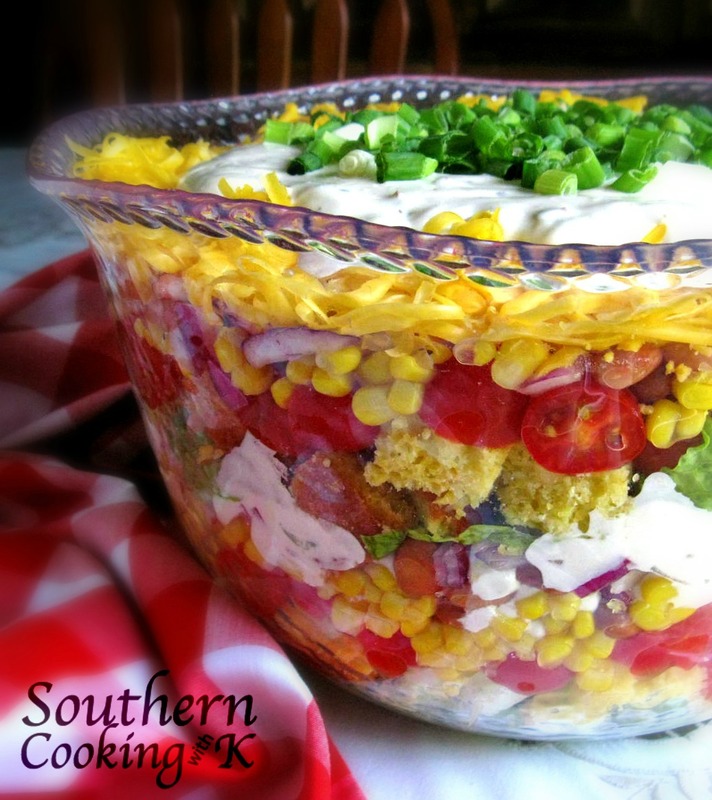 There are so many ways you can serve this Southern golden goodness. My husband's favorite is with Fried Catfish. You just take a small spoon, and make them into little round hush puppies. My favorite, is to make them into a patty shape by using a larger spoon dropping them into the hot grease and eat them with some peas--like I did with these Fresh Lady Cream Peas. In a medium bowl, mix together cornmeal and salt. Stir in enough boiling hot water that the cornmeal mixture comes together enough to spoon (not too thick and not too thin, kinda like creamy mashed potatoes). 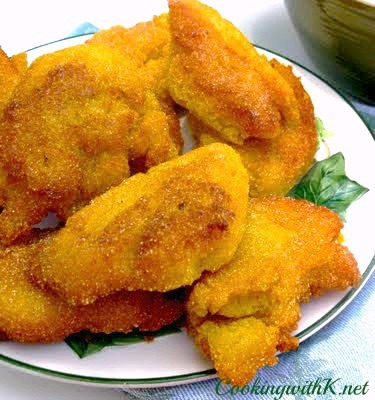 As soon as the oil in the skillet is hot, but not smoking, spoon hot cornmeal mixture in your hands that have been dipped in hot/warm water and then gently place in the hot oil. Fry each in hot oil, turning once, until crisp and golden brown, about 5 minutes. Drain on paper towels. Note: The Hot Water Cornmeal will be really tender if you try not to handle the cornmeal mixture with your hand so much. Wet your hands with hot/warm water in between spooning it! You can add a couple tablespoons of sugar if you want it sweet. This sounds great! I love simple recipes like this. But I have to say for me the bacon grease would not be optional - it's a must! That looks totally neat! Thanks for sharing such a cool recipe. These would be great in our house! We are gluten free and these would be perfect to accompany many of our meals instead of bread. Hi, dropping by from Wed. Blog Hop. So many wonderful cooks never wrote down a recipe. I hope the trend is changing thanks to blogs. Oooo, I just melt thinking of when my grandmother used to make some! Heaven on earth, let me tell ya! Soooo Southern, too! THANKS! Wow that looks delicious. Great post. Come over and visit. We have a wonderful sorbet recipe today for this hot weather. This sounds lovely. Its completely new to me. does sound perfect with those fresh lady cream peas! Love this old-school recipe. Thanks so much for sharing on Friday Food on Momtrends. I love checking out all the foodie creations. Enjoy the weekend. Hubby wanted me to make cornbread but always all the time it turned out too dry. Well gonna try this recipe of yours. Thanks for sharing and happy weekend! I bet these are fantastic! Thanks for linking them up on the FBF hop! Yum! This makes me miss my Mama. I was raised on hot water cornbread; but, I've never made it myself. I guess I'm going to have to start since my mom is a couple of thousand miles away now. Thanks for sharing this recipe! Love cornbread. Some nice fish with this and I'd be happy for days. Hehe...I had already followed your link for your Grandma's hot water cornbread over from your cream peas post! So glad that you are sharing this recipe with the Sunday Favorites party as well! I must admit, I have never heard of making cornbread this way! I will have to give it a try! My grandmother made Hot Water Cornbread and it was delicious and your recipe sure brings back wonderful memories for me. Thank you so much for sharing with Full Plate Thursday and hope to see you again real soon. Hope you are having a great week! mmmm... i can think of a few meal these would go well with. sometimes the most simple recipes are the best... thanks for sharing it. Never heard of hot water corn bread before but it sounds delicious. I would love for you to stop by DIY Home Sweet Home today and link up your recipe and any other projects you would like to share. Happy Monday!! Thank you for the post! My husband talks about hot water corn bread all of the time. Now I have a recipe! Hello K! I found you through At Home With Haley’s Blog Hop. I don't think I've ever had hot water cornbread...looks interesting! Im so glad my Nanna taught me how to make this secret treasure. It wasnt until we started moving and living all over the world that I realized some people are just deprived!!! 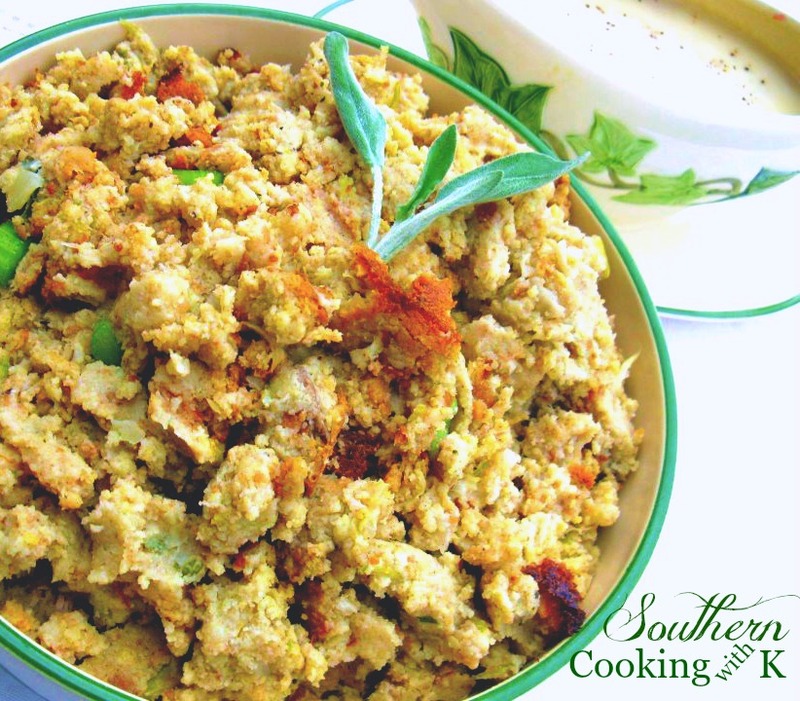 They have never ever had this wonderful wonderful southern staple...I make it for my "uncultured" friends all the time...lol. I love the fact that you have cream peas in the photo as well. I soooo miss them. I was able to bring some home with me from my Nanas garden when I was in Tx this summer and Im saving them for the right time,probably Thanksgiving!! Be Blessed and keep blogging!! Living all over the world is a trick worthy of Merlin, but I think most well traveled, worldly folks would agree that good hot water cornbread is among the world's treasures. Indeed it's addictive ... and being deprived of it can truly make one depraved! That proper feel for the texture of the mixture is far more important than accurate measurement is something missed by most! I personally prefer white cornmeal and a somewhat wetter texture, just firm enough to form pones ... probably start with 2½ cups water to 1½ cups of meal and adjust ... baked, not fried, at about 400° F.
Like my wife used to say ... it's to die for! I grew up on hot water cornbread and have posted it several times. No one seems to have ever heard about it. My mama made it and now, I've made it for years. It is one of my hubs favorite things in the whole world. I make mine just like your granny did. :)) ...pure Southern. O, after looking at your recipe again, I should say I wet my hands in hot water and form into patties before I drop them into the hot grease. 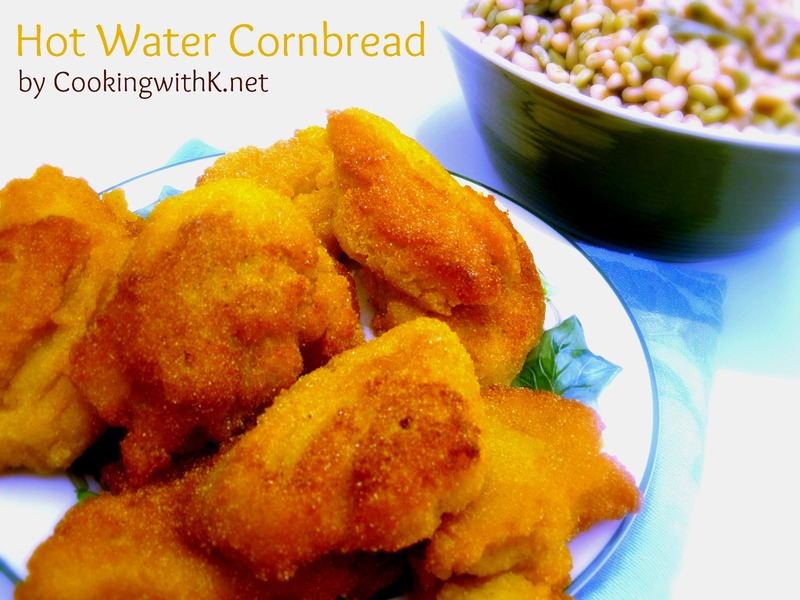 Oh, I've got memories of hot water cornbread from my childhood! Whenever we'd go to Alabama to visit my grandparents, this was ALWAYS on the table! :) Thank you so much for linking up with me this week at Tasty Tuesdays! I’ve pinned this & shared it with my followers! Please be sure to stop back by the party and check out some of the other links! Have fixed this for years. My daughter says im the only one she knows that makes it. It is so delicious with greens or beans or gumbo. I keep the water on the stove boiling for k know that the second batch will need a little more water as it stiffens up. Thanks, Kay! I haven't had any hot water cornbread since ....years! Mom and my grandmother both used to make it. Exactly like this recipe too! And what I'd give for some fresh Lady Creams....I sooo miss Texas!!! Wanted some hot water cornbread to go with baby Lima beans & rice. Haven't made it in years and due to a stroke I couldn't remember how to make it. Thanks so much I'm writing it down. Thank you for stopping by…gotta love cornbread and beans…delicious! In Puerto Rico we make these as well and do in different ways. If sweet, we add sugar and cinnamon. Delicious! If salty, we may stuff with cheese and then fry them. Then we dip in a mayo-ketchup- garlic sauce. Love it with soup!!! Home made beef/veggie soup is my favorite!! This is known as "Bannock" up here in the north, and has been a favorite here for many a year. We enjoy it with Stewed Beans, Tripe, and Fried Smelt at my house. It originated in New England, just to let you know. This sure sounds awesome. I had an aunt in Georgia that cooked this when I was a girl growing up. Can you use cornmeal mix? That's all I have in the house at tge time. I have used cornmeal mix in a pinch. I must say though that the texture will be more like hush puppies and they are delicious! Thank you for stopping by...all the best! Oh my Lands! I sure would love to eat at your table. We SO look forward to hot water cornbread when we visit a home cooking restaurant in TN. Now I can make my own!? YOWZA! Thanks for sharing with us at Weekend Potluck. These sound similar to what my Grandma made. She made hers more like a pancake. So good! I remember watching her make them. It was a little of this and a little of that. She never measured anything. She usually served them with green beans cooked for hours with salt pork or hamhock. I miss her and her simple delicious meals. I grew up on this good stuff! My mother, grandmother & aunts made this bread without a recipe (recipe was in their heads). I'm glad to find this written recipe from you because although I watched them make it many times, I never knew the proportions of the ingredients to put in it. Thanks! And Merry Christmas and a Happy Holiday season! Merry Christmas and welcome to CWK!